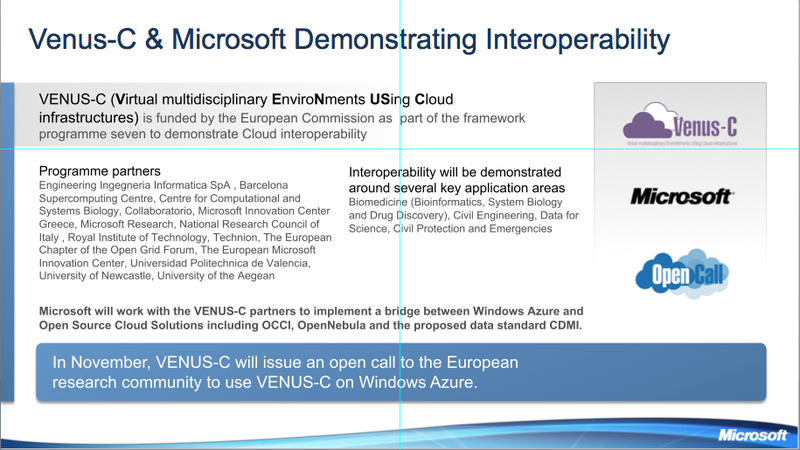 many thanks for enphasizing the challenges of VENUS-C. The project, that I’m coordinating, is aiming at providing a set of PaaS services to Scientific Application developers that allow to hide the inner complexities (and differences) among public, commercial PaaS (e.g. MS Azure) and open source solutions (e.g. ONE. What is unclear in your post (and possible in the marketing synthesis in the Dan Reed’s slides) is the concept of bridging. If you intend that MS Azure may access OpenNebula resource or viceversa – that’s misleading. On the contrary, the Scientific developers will be allowed to used one (or both) cloud providers in a seamless way. Announcing the release of OpenNebula 2.0! Thanks to everyone who made OpenNebula 2.0 possible!